This study aims to improve the metacognitive awareness of English language preservice teachers. 10 pre-service teachers who participated in the study took part in an 18-hour-drama workshop. The same inventory, MAIT, was administered to the participants twice: in the beginning and at the end of the process. Additionally, interview forms were filled in, and focus group discussions were held at the end of each drama session. Finally, drama products were collected. As a result of the mixed method data analysis, it was found that there was a positive improvement in the metacognitive awareness of the participants. In addition, it was were observed that the participants gained not only academic and professional awareness, but also personal development. Bu çalışma İngilizce öğretmeni adaylarının üstbilişsel farkındalıklarının yaratıcı drama ile geliştirilmesini amaçlamaktadır. Çalışmaya katılan 10 öğretmen adayına 18 saatlik drama eğitimi verilmiştir. Drama eğitimi öncesi ve sonrasında aynı anket uygulanmış, sonrasında ayrıca görüşme formları doldurulmuş, her atölye bitiminde odak grup tartışmaları yapılmış ve katılımcı ürünleri toplanmıştır. Bu araçlarla elde edilen verilerin nicel ve nitel karma analizlerinin sonucunda katılımcıların üstbilişsel farkındalıklarında olumlu yönde bir gelişim olduğu görülmüştür. Ayrıca sadece akademik ve mesleki farkındalık değil, kişisel gelişim anlamında bireysel kazanımların oluştuğu da gözlemlenmiştir. Abu Rass, R. (2010). Drama in chalk and talk classrooms. Journal of Language Teaching and Research, 1(4), 378-381. Adıgüzel, Ö. (2012). Eğitimde yaratıcı drama. Natürel Yayıncılık, Ankara. Akpınar Dellal, N., & Kara, Z. (2010). Awareness levels of foreign language teacher candidates and teachers about drama techniques. Dil Dergisi, 149, 7-29. Almaz, G., İşeri, K., & Ünal, E. (2014). Research of the self-efficacy perceptions of teacher candidates towards the usage of creative drama method. International Journal of Languages’ Education and Teaching, December, 48-65. Aşılıoğlu, B. (2006). The perceptions of student teachers of English regarding their competencies in teaching methods and techniques. 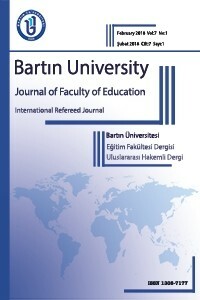 Eurasian Journal of Educational Research, 22, 1-11. Aykaç, M. & Çetinkaya, G. (2013). The effect of creative drama activities on pre-service Turkish language teachers’ speaking skills. Turkish Studies- International Periodical for the Languages, Literature, and History of Turkish or Turkic, 8-9, 671-682. Aytaş, G. (2013). Eğitim ve öğretimde alternatif bir yöntem: Yaratıcı drama. Adıyaman Üniversitesi Sosyal Bilimler Enstitüsü Dergisi, 6(12), 35-54. Başçı, Z., & Gündoğdu, K. (2011). The attitudes and opinions of prospective teachers related to drama courses: The case of Atatürk University. Elementary Education Online, 10(2), 454-467. Balçıkanlı, C. (2011). Meta-cognitive awareness inventory for teachers (MAIT). Electronic Journal of Research in Educational Psychology, 9(3), 1309-1332. Ceylan, Ş., & Ömeroğlu, E. (2011). An examination of the attitudes of students and professors at early childhood education programs regarding drama courses at the preschool level. Ahi Evran Üniversitesi Kırşehir Eğitim Fakültesi Dergisi (KEFAD), 12(4), 225-242. Çetingöz, D. (2012). Pre-school prospective teachers’ self-efficacy levels on using the creative drama method. Hacettepe University Journal of Education, 42, 131-142. Demircioğlu, Ş. (2010). Teaching English vocabulary to young learners via drama. Procedia Social and Behavioral Sciences, 2, 439-443. Demirel, Ö. (1983). Orta öğretim kurumlarında yabancı dil öğretim ve sorunları. Türk Eğitim Derneği Bilimsel Toplantısı, Ankara. Er, A. (2003). Drama ve dil öğretimi: Dramanın sözlü dil öğretimine etkisi. Kazım Karabekir Eğitim Fakültesi Dergisi, 8, 246-254. Erozan, F. (2005). Evaluating the language improvement courses in the undergraduate ELT curriculum at Eastern Mediterranean University: A case study. (Yayınlanmamış Doktora Tezi) Orta Doğu Teknik Üniversitesi, Ankara, Turkey. Flavell, J. H. (1979). Metacognition and cognitive monitoring: a new area of cognitive-developmental inquiry. American Psychologist, 34(10), 906-917. Genç, N. H. (2003). Yabancı dil öğretiminde öğretim tekniği olarak dramanın kullanımı ve bir örnek. Kazım Karabekir Eğitim Fakültesi Dergisi, 8, 267-276. Hacker, D. J., Dunlosky, J., & Graesser, A. C. (Eds.). Metacognition in educational theory and practice. Mahwah, NJ: Lawrence Erlbaum Associates Publishers. Heathcote, D. (1984). Collected writings. Hutchinson, London. Hismanoğlu, S. (2012). Prospective EFL teachers’ views on English language teacher training program. Journal of Research in Education and Teaching, 1(2), 330-341. İnceçay, G. (2012). Turkey’s foreign language policy at primary level: Challanges in practice. International Association of Research in Foreign Language Education and Applied Linguistics ELT Research Journal, 1(1), 53-62. Johnson, C. (2002). Drama and metacognition. Early Childhood Development and Care, 172(6), 595-602. Köksal-Akyol, A. (2003). Drama ve dramanın önemi. Türk Eğitim Bilimleri Dergisi, 2(1), 179-190. Oktay, A. (2015). Foreign language teaching: A problem in Turkish education. Procedia-Social and Behavioral Sciences, 174, 584-593. Özdemir, S. M., & Çakmak, A. (2008). The effect of drama education on the prospective teachers’ creativity. International Journal of Instruction, 1(1), 13-30. Özmen, K. S. (2010). Teaching as a performing art: Promoting nonverbal immediacy of English teacher trainees. (Yayınlanmamış Doktora Tezi) Gazi Üniversitesi, Ankara. Öztürk, A. (2001). Eğitim-öğretimde yeni bir yaklaşım: Yaratıcı drama. Kurgu Dergisi, 18, 251-259. Schraw, G., & Moshman, D. (1995). Metacognitive theories. Educational Psychology Review, 7, 351-373. Tanrıseven, I., & Aykaç, M. (2013). Opinions of the university students related to creative drama’s contribution to their personal and professional lives. Adıyaman Üniversitesi Sosyal Bilimler Enstitüsü Dergisi, 6(12), 329-348. Tate, K. J. (2005). A conceptual lens for observing, analyzing, and ınterpreting data when exploring preservice creative drama. Youth Theatre Journal, 19(1), 151-170. Yavuz, A. & Zehir Topkaya, E. (2013). Teacher educators’ evaluation of the English language teaching program: A Turkish case. Novitas-ROYAL (Research on Youth and Language), 7(1), 64-83. Yeğen, G. (2003). Yaratıcı drama. İlköğretim-Online Öğretim Uygulamaları Serisi, 2(2), 1-4. YÖK (1998). Eğitim Fakültesi Öğretmen Yetiştirme Lisans Programları Mart 1998. YÖK (2007). Eğitim Fakültesi Öğretmen Yetiştirme Lisans Programları Haziran 2007.